by Bryan Mero Solo: A Star War Story (2018) is the origin story of Han Solo from Star Wars. If you don't know that already, you’re reading the wrong review...and have missed a major cultural iconic series of movies that has influenced generations. From the time Star Wars: A New Hope (1977) descended onto theaters people love Han Solo. He's a smuggler, scoundrel and sometimes a little scruffy looking. He's got a big sidekick Wookie named Chewbacca. He's charming, bold and always looking out for himself...but still has a heart of gold. Solo: A Star Wars Story tries to explain why Han Solo is Han Solo. From the start this is where the movie gets itself into trouble. The movies shows us Han's escape from his home planet but we never get to spend enough time there, then we time jump to Han's fall from the Empirial Navy, not really knowing how or why he was demoted. The movie moves into this trend for the entire story. Each subplot felt just a bit underwhelming and fast. Han's move from military deserter to smuggler is literally overnight. This movie is a series of small action sequences that never seem to compliment one another. We get stuck in the track of, 'oh, that's how he got his name' or 'oh, that's how he and Chewie are friends' and so on. All this to say that Solo: A Star Wars Story (2018) is not a 'bad' movie. It's actually put together quite well. The problem is the story itself and the development of characters. We meet several new characters but really there are maybe two characters that I even partially remember their names. And some characters are gone before you really find out who they are and what they mean to Han. A character death should convey feelings, in one way or another. Character deaths in this movie feel bland. There's no feeling of loss or sadness in most cases. It's just too bad that they died. I applaud Ron Howard, the new director, for taking on this project. After the other set of directors were fired due to conflicting vision of the movie with Disney, Howard took over, reshot 70% of the scenes and put together a coherent story. There is some great imagery. I enjoyed Alden Ehrenreich's portrayal of Han Solo. It didn't take long to identify this new face as Han. Donald Glover was also great as Lando. L3-37 is Lando's co-pilot android play by Phoebe Waller-Bridge and was probably the best performance of the bunch! With that said...it's a bit disappointing when an android is the most likable character and the one you feel the most for in this movie. I can't help but keep coming back to saying this was a good movie...but really it's a safe movie. It's predictable. You see each plot point coming a parsec away. I'm not mad...just disappointed. I would have much rather seen Han's fall from the military or a bigger deal of the Kessel run...instead they are each their own small adventure that never really adds up to a great movie. Do I recommend this movie? If your a Star Wars fan, of course you should see this movie. Go during a matinee. No need for opening night tickets. I will still not get over the lack of fan faire at the beginning of the Star Wars Story movies. Rogue One was like this...we get the "a long time ago" but instead of the blast of STAR WARS and the iconic sound track, we get more written text with no music and it feels like a let-down from the beginning. We were in a full theater and there was never a moment where we all clapped together or laughed together. I think we all sat in stunned silence at to what we just saw. I'm sure many will like this film and other will hate it. It's a great movie to take your kids to on a long Memorial Day weekend. Not much in the parental warning department. Besides some character deaths, it's all very clean besides some implied adult situations. 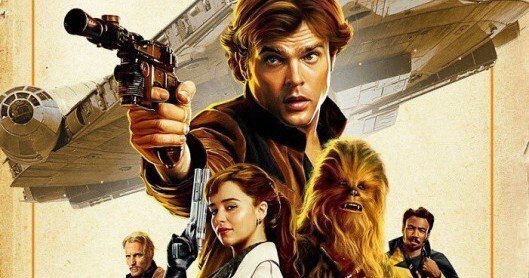 So go see Solo just for the fun of it. Don't expect some great revelations to Han's back story.